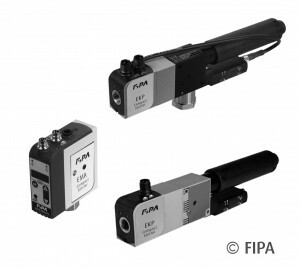 High cycle rate, low energy costs: FIPA ejectors (http://www.fipa.com/) save energy without compromising cycle times. Integrated pressure regulation reduces consumption of compressed air for air-tight and porous workpieces. FIPA ejectors with additional electronic air-saving function reduce energy consumption even further for air-tight workpieces. “Our ejectors with air-saving function are another example of how FIPA meets current market requirements thanks to a sophisticated solution design ,” said Rainer Mehrer, CEO of FIPA. Those who want to reduce energy costs usually have electricity and heat in mind. However, the resource compressed air has a considerable savings potential. The EKPP, EKP and EMM series FIPA ejectors make a real contribution here. Equipped with automatic pressure regulation, they reduce compressed air consumption by up to 50 % per workpiece, regardless of the porosity. For air-tight workpieces, the EMA and EKP-LSE series ejectors even make it possible, by means of an electronic air-saving function, to achieve savings of up to approximately 97 %. To understand this, it may be helpful to take a more detailed look at the ejectors. Industrial compressed air systems typically operate at around 4 to 8 bar. All FIPA ejectors use 3,5 bar internally and already reach the maximum vacuum level at a feed pressure of 4 bar. The ejector brings higher feed pressures down to 4 bar internally, so that, independent of feed pressure, it uses only 3,5 bar. Thus, for example, in an application that involves the handling of wooden panels, an annual savings of around 23 % could already be achieved at feed pressure of 5 bar, using an EKP series ejector with a nominal width of 1,5 mm. The following operating data applied in this case: 20 cycles per minute, 2-shift operation with 14-hour usage, 220 workdays and an air consumption of 64,5 liters per minute. Although comparable solutions using multi-chamber ejectors reduce air consumption, they suffer from a system-induced higher evacuation time. In other words, it takes longer for the vacuum to build up – with the result that cycle time increases and efficiency thus decreases. Save even more energy using the air-saving function For air-tight products, such as sheet metal or wooden floorboards, the user can achieve additional savings using the EMA and EKP-LSE FIPA ejectors that come equipped with an electronic air-saving function. The integrated electronics is triggered as soon as the vacuum level reaches the set switching point for “part has been gripped”. Until a certain threshold value is reached, there is no readjustment and thus no compressed air is consumed. Energy savings of up to about 97 % can thus be achieved for air-tight workpieces. What’s more, the integrated design means the FIPA solution – with its maximum weight of 250 grams – is up to 50 % lighter than comparable products on the market.